After I finished building my 2-way bookshelf speakers, the Monitor DX625 made from a 6″ Hi-Vi Research W6 driver and Vifa DX25GT 1″ tweeter, I began looking for a pair of speaker stands to put the speakers on. They needed to be the right height so that the tweeter was just below ear level when seated, they needed to be the right look, be nice and heavy, and not cost a fortune. I couldn’t find any that were the exact right height or within the cost that I wanted or the exact style I wanted, so I decided to build some speakers stands out of some scrap wood I had lying around in my garage. Of all the speakers I’ve built, I’ve never built a pair of speaker stands, so I thought this would be a great first-time project to work on. It turned out to be a lot of fun, and so much easier than building actual speakers, and the end result I think was well worth the time spent working on them. The design is extremely simple and possibly resembles some other speakers stands out there. The design was driven by what I currently had in the garage sitting around as scrap, waiting to be used for something useful. Material: About 2’x2′ piece of 3/4″ MDF cut into 4 rectangles – two pieces 9″x11″ for the top and two pieces 12″x13-3/4″ for the base. One 10′ two-by-six (2×6) board. 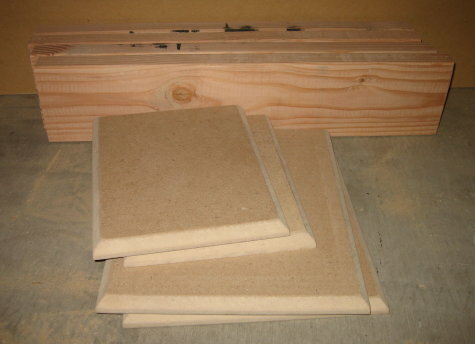 The two-by-six was cut into (4) pieces 26″ long to be used for the uprights in each speaker stand. I cut all the edges of the (4) MDF pieces at 45 angle to give the speakers stands a more original and finished look, as well to match the speakers better. 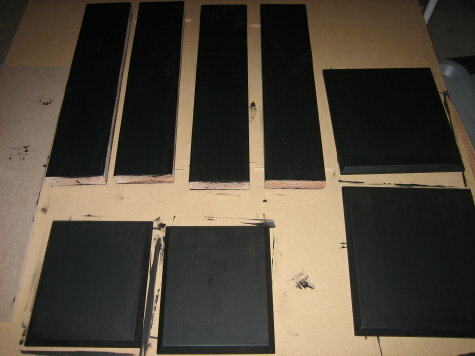 I sanded all the wood wood with 150 then 220 grit sandpaper and threw on a coat of Painter’s Touch flat black enamel. Once that dried I sanded everything down once again with 220 and put on another coat of paint. After that was dried, I assembled each piece by centering the (2) 26″ two-by-six uprights on the base and screwing them in with (3) 10×2-1/2″ wood nails. Then I attached the top in the same manner. The two uprights are mounted 2″ apart and allow enough room for me to touch up the paint if needed or for dusting. I put some putty in the six holes of each top base and put on two more coats of paint and let everything dry overnight. The next day they were done, so I took a few pictures and set them up with my 2-way speakers and tested them out. I think they look great, and only cost a fraction of what a commercial pair of speakers stands would have cost. And since all the wood, screws and paint I already had, it felt like it cost me nothing at all. But the benefit of having a real pair of speaker stands in the living room (instead of a pair of chairs from the kitchen table) was definitely worth the time spent designing, building, sanding and painting them. At some point in the future I may add a set of toe spikes to the base piece and speakers, but for now I like having the ability to easily rotate the speaker/stand as desired for more/less toe-in. Now it’s time to pull up a chair, pop in a few CD’s, and spend the afternoon enjoying some music. Click here to view the CAD design/plans for these speaker stands. Stop by www.danmarx.org/audioinnovation for more speaker projects. This entry was posted in Audio/Video and tagged cut, designs, DIY, speakers, stands, wood. Bookmark the permalink. Nice design! Very helpful instructions, and easy to modify for your own speaker dimensions. Very cool. I’m going to Home Depot tonight. Well done! Very impressive, stylish design. Great instructions and a great end result. I kept encountering PVC DIY stand instructions when I searched, but finally found these. And like you, I have scrap MDF and 2 x 6 lumber laying around. These will work well to support my old PSB Alphas in my new HT room. These stands blend in very well. The stands do not have that over done home made look. The materials required are inexpensive. I’m in the process of building these right now! :D Although I was too lazy to cut the angles on a 45, and I can honestly say I wish I had… Also AMAZING paint! I used it to paint both my Xbox and router and they came out excellent. It just goes on so level! Looks great. How did you cut the 45 degree angle? Amazing. I can’t tell whether it is DIY or real speaker stand! i have a quad 11L2 speaker looking for a perfect design and measurement can you please send me the design of it. 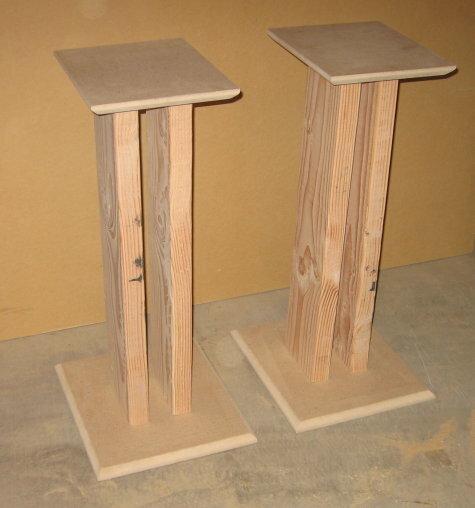 I’ve been scouring the web looking for plans to make speaker stands that didn’t use the “two pieces of wood connected to a PVC pipe” plans. These will work great! Thanks man! just what i was lookin for! For all the versions of PVC stands out there, these are even cheaper, easier to make, and look classier IMO. Great share, thanks! this saves a TON of money. What do you think of using spikes for carpets? Thanks so much for this. Its a great idea – and my speakers are exactly the same dimensions as yours. Now i know what I am doing next weekend. I’ve been looking for an easy but nice looking speaker stand for my new ELAC B6 Debut speakers. I’ve seen quite a few DIY projects but most are either a bit complicated or they use PVC pipe which I don’t like. This project is very simple and all in wood that I can paint or stain and I can also choose what wood I would like to use. I decided to use pine for legs and cherry for the platforms and base. They look great and I was done in just 2 days sanding, staining base & platforms and painted legs flat black. I added a small piece of wood, 6×6 inches, to the base as an accent and painted it white. My friends ask where did I buy them. They actually look that good. Just sand thoroughly and after the first tinting and paint job sand with a 600 grit sandpaper and give it a second hand. I finished the job with a clear protective coat of spray varnish. Two hands of clear. You’ll be surprised how great they look…. enjoy. I’m helping my son build a humble in-house mixing studio, and we needed a design for speaker stands. These fit the bill perfectly, until he mentioned that he was thinking of changing his choice of monitor. So I took your design and modified it to make it adjustable in height for when decides to make the switch. I’m be happy to send you the plans I made on Google Sketch Up. Having your plans here saved me a lot of time coming up with a basic design. Thanks George for the extra tip! Glad you (and your friends) like your speaker stands. Thank you for the plans and write-up. I made a pair of 40″ stands for my surround speakers and tried the bevel feature on my circular saw for the first time. So far so good (still need to assemble them). This is not a good design. The issue is the lateral stability of the two vertical boards that connect the platform. Because they are not joined together, and are only held by screws at the end, any lateral pressure such as a speaker set off-center could easily cause these to fail. A better design would be to simply add a third board between them so the overhead would look something like |-|. If the boards are tightly fitted, they don’t even need to be joined to each other, just to the platforms, and would increase the lateral strength of the design to something safe for those precious speakers.